Two Melbourne apartments once owned by disgraced doctor Geoffrey Edelsten were offloaded in a fire sale this weekend, but his ex-wife has staked her claim on the properties amid their ongoing divorce battle. Geoffrey Edelsten and former partner Brynne Edelsten (nee Gordon) are still embroiled in a split settlement after the messy break-down of their high-profile, four-year marriage. The penthouses on Exhibition Street, which went to auction consecutively, bore no trace of the flamboyant de-registered medico and his partner Gabi Grecko. Mr Edelsten’s ex-wife Brynne Gordon has staked her claim on the properties amid their ongoing divorce battle. Despite the properties’ colourful history, it could have been any other auction unfolding across on Melbourne, with families clustered together and men in t-shirts and jeans on their phones, doing the sums before considering a bid. The three bedroom apartment sold to a man in black for $1,607,000 after a drawn-old bidding war against a woman with a whopping Louis Vuitton handbag. 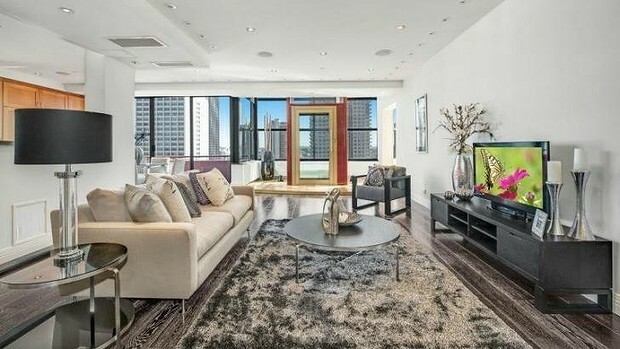 Earlier, the one-bedroom pad was passed in for $1,301,000 but sold later by negotiation. Mr Edelsten paid $1.2 million for each of the homes in February, 2011, but he won’t pocket the windfall from the auctions. It’s understood he and his on-off flame and now fiance Gabi Grecko​ have not lived at Exhibition Street for several months. The medical entrepreneur, who was declared bankrupt and de-registered as a doctor in the 1980s, revealed last year his 91-year-old mother had been bankrolling​ his lifestyle. Ms Gordon, whom he wed in a lavish $3 million ceremony at Crown Casino in 2009, slapped down caveats on the penthouses in February this year through her lawyers. The apartment sales follow feared debt collector and gangland identity Mick Gatto paying a visit to Geoffrey Edelsten to “remind” him of his financial obligations to his ex-wife. It was revealed in September last year that the former Carlton Crew boss and an associate were “hired” by a connection of Ms Gordon’s new beau, to emphasise Geoffrey Edelsten’s responsibilities to his ex-wife. The meeting came after the couple’s protracted separation has repeatedly erupted in a media slanging match between Brynne, the controversial businessman and his new beau Gabi Grecko, which has seen the trio publicly trading insults and accusations of infidelity. The dispute has also festered amid claims Mr Edelsten has continued to spend lavishly on himself but allegedly withheld financial support from Brynne, including seeking to have her car repossessed. Mr Mick Gatto declined to comment on the settlement amount that was requested or the identity of the person who contracted his services. But a source said that Mick Gatto, who has established a reputation as one of the city’s most prominent and feared debt collectors, was approached by a “friend” close to Brynne and her new boyfriend, professional weightlifter Big Red Ra. And it looks like Edelston’s current fiancé, Gabi Grecko might be walking down the aisle with her much older boyfriend Geoffrey Edelsten, 71, sooner than anticipated, revealing his divorce from wife Brynne Edelsten is days away from being finalised. ‘We’ve waited so long it feels like forever but I’ll be excited to be the new Gabi Grecko Edelsten,’ said the corset-loving blonde.